LMS for Gospel Organ is Here! As you guys already know, we are the inventors of this new LMS technology. LMS stands for Live-MIDI-Sync, where we are able to display live MIDI events, notes, and chord names simultaneously and in sync with the audio. But now we have a special treat for you. We are now introducing LMS technology for the organ! 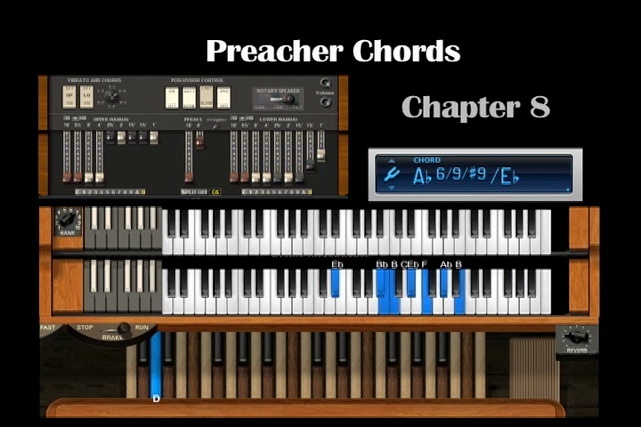 Not only are we able to display all of the same material from our other DVDs, but now we are able to take it a step further in offering even more visual aids for the organ. You will also be pleasantly surprised at the incredible sound of the organ sounds. Through physical modeling we are able to change the key clicks, ambient, mic position, reverb, and other important sound aspects of the organ. This thing does not sound like your average standard MIDI organ, but now we have a full, fat gospel sounding organ. As a special bonus, we are able to display things unimaginable. Think of the old LMS we used on all of our other vidoes and now add, drawbar settings, tremolo, chorus, leslie switches, and percussion sounds. We are even able to display the bass foot pedals lit up with note names. That’s not all. The bass, combined with the upper and lower manuals combine to form a chord. What that means is if I play the bass note with a chord, the chord name will display the chord wit the bass pedal. Many times as organ players you want to know the entire chord with the bass (root). It’s all here with our new LMS technology for the organ!